A great idea for any coupon lover. Stay organized! We will be glad to rectify any problems you may have. Top Loading pages. Crystal Clear Poly Propylene (safe - no pvc and acid free). MINI COUPON SLEEVES. COUPON SLEEVES / HOLDERS PAGES. These sleeves areTop Loaders &Soft but sturdy material that you can bend . FOR STANDARD MINI 3-RING BINDERS. MINI 4-POCKETS COUPONS PAGES (25 PAGES TOTAL - 100 POCKETS TOTAL ). Soft And Chewy Sour Patch Kids Coupons 52 Arv $2.29 Each Expires 3/31/2020. Shipped with USPS First Class Package. Collectible 2018 Keychain Card. For One Jr. Frosty - Expired 12/31/18. MINI COUPON SLEEVES. COUPON SLEEVES / HOLDERS PAGES. MINI 4-POCKETS COUPONS PAGES (30 PAGES TOTAL - 120 POCKETS TOTAL ). These sleeves areTop Loaders &Soft but sturdy material that you can bend . FOR STANDARD MINI 3-RING BINDERS. MINI COUPON SLEEVES. COUPON SLEEVES / HOLDERS PAGES. These sleeves areTop Loaders &Soft but sturdy material that you can bend . MINI 4-POCKETS COUPONS PAGES (20 PAGES TOTAL - 80 POCKETS TOTAL ). FOR STANDARD MINI 3-RING BINDERS. MINI COUPON SLEEVES. COUPON SLEEVES / HOLDERS PAGES. These sleeves areTop Loaders &Soft but sturdy material that you can bend . FOR STANDARD MINI 3-RING BINDERS. MINI 4-POCKETS COUPONS PAGES (5 PAGES TOTAL - 20 POCKETS TOTAL ). For One Jr. Frosty - Expired 12/31/15. 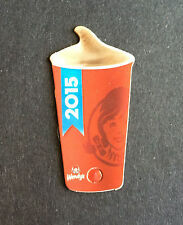 Collectible 2015 Keychain Card. Designer Herringbone design Trash and Tissue Containers. Herringbone pattern. Woven hemp. Trash Container. Tissue Container. Black and White. New and unused. It's a party waiting to happen! Make a Really Big Impression! Coupon organizer combo 3" black binder and 30 binder organizer pages! (1) 3" black 3 ring binder. (10) 3 pocket pages. (10) 4 pocket pages. (10) 6 pocket pages. 15 coupons exp. dates are from May 31,2019 to. This is a set from spoon, 2 forks and knife. (3) Coupon Sheets - Only Valid for Chicagoland / Northwest Indiana. McDonald's. Expire 05/14/19. Manufacturer: Hobbymaster. Here are all the page styles you need to organize your coupons. Multiple pocket sizes are included to hold virtually any size coupon. You get enough pages to hold almost 300 coupons, or many more if you put more than one in each pocket. SPORT COLLECTOR'S PARADISE. - Holds up to 90 Protective Pages. - Only available in Black. These binder pages are great for storing and sorting your coupons! This product features high clarity and top loading pockets with strong welds. BCW Pro 4-Pocket pages fit all standard 3-ring binders and albums. These binder pages are great for storing and sorting your larger coupons! The BCW Pro 1-Pocket page is an acid free archival quality product that is perfect for storing periodicals or 8.5 X 11 sheets and can be used in the office or for scrap booking. This is a set from bronze spoon and knife. MINI COUPON SLEEVES. COUPON SLEEVES / HOLDERS PAGES. These sleeves areTop Loaders &Soft but sturdy material that you can bend . MINI 4-POCKETS COUPONS PAGES (10 PAGES TOTAL - 40 POCKETS TOTAL ). FOR STANDARD MINI 3-RING BINDERS. Here are all the page styles you need to organize your coupons. Multiple pocket sizes are included to hold virtually any size coupon. You get enough pages to hold almost, or many more if you put more than one in each pocket. Here are all the page styles you need to organize your coupons. Multiple pocket sizes are included to hold virtually any size coupon. You get enough pages to hold almost 300 coupons, or many more if you put more than one in each pocket.